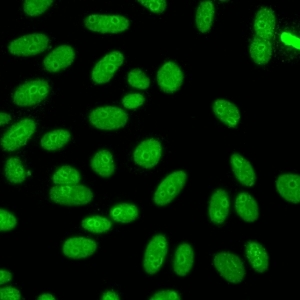 1)	Prominent fine speckled AC-4 type nuclear staining in interphase cells. 2)	Consistent strong fine speckled staining of condensed chromatin in mitotic cells. Depending on the serum dilution used, the mitotic chromatin staining may appear homogeneous. 3)	Strong staining of nucleolar organizing region (NOR) associated on condensed chromosomes in mitotic cells. This NOR staining may be obscured by the bright chromosomal staining as NORs are not always on the same focal plane (see figure below). 4)	Weak cytoplasmic staining in interphase (and mitotic) cells depicts a delicate network radiating from the perinuclear area towards the plasma membrane; in general, during titering sera to higher dilutions relatively more prominent cytoplasmic staining can be observed. 5)	Variable nucleolar staining that can appear as a punctate nucleolar or perinucleolar staining in interphase cells. Nucleolar staining is not a universal feature of this pattern. This 5-element compound staining pattern has been observed in most commercial HEp-2 cell slides, but there may be some variations in the expression of each element according to the slide brand. The detection of all 5 elements may be a challenge especially when only using a single serum dilution (e.g. strong mitotic chromatin staining obscures NOR) or in many semi-automated systems when images are often selected on a single focal plane (e.g. NOR or cytoplasmic staining not in same focal plane as interphase nuclei). Practical recommendation how to routinely screen for AC-29 with a HEp-2 slide that show this pattern using a traditional microscope setting: if the above 1) and 2) features are observed on routine samples suggestive of the AC-29, the next step should be to look for 3) positive NOR staining by searching different focal planes for NORs on mitotic chromatins. Next, the presence of the 4) cytoplasmic staining and lastly 5) the nucleolar staining should be evaluated. 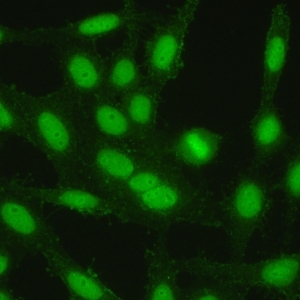 In some HEp-2 slides, the nucleolar staining is only visible near the edge of the well. Dellavance A, Gallindo C, Soares MG, da Silva NP, Mortara RA, Andrade LE. 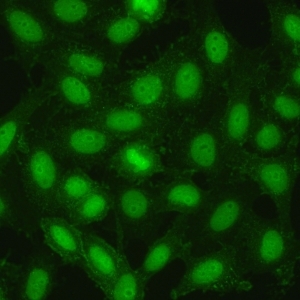 Redefining the Scl-70 indirect immunofluorescence pattern: autoantibodies to DNA topoisomerase I yield a specific compound immunofluorescence pattern. Rheumatology (Oxford). 2009;48:632-7. Andrade LEC, Klotz W, Herold M, Conrad K, Ronnelid J, Fritzler MJ, von Muhlen CA, Satoh M, Damoiseaux J, de Melo Cruvinel W, Chan EKL. International consensus on antinuclear antibody patterns: definition of the AC-29 pattern associated with antibodies to DNA topoisomerase I. Clin Chem Lab Med. 2018;56:1783-8. 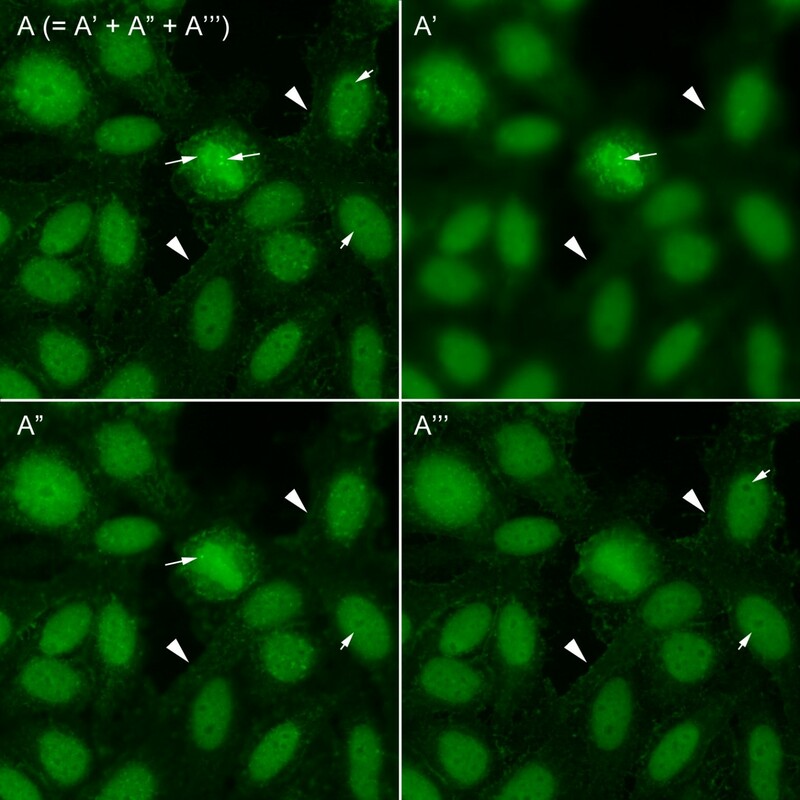 INOVA HEp-2 images illustrating the AC-29 pattern with staining in all 5 compartments. Panel A is a merged image from the other 3 panels (A', A'', A''') representing different optical sections/focal planes, each illustrating the unique stained structures not obvious in the other focal planes. In addition to the obvious nucleoplasmic and mitotic condensed chromatin staining, panel A' illustrates two bright NORs in focus (arrow) on condensed chromatin in the mitotic cell; panel A'' shows another NOR in focus (arrow) in the same cell; A''' shows characteristic cytoplasmic (arrowhead) and weak perinucleolar staining (short arrow). Fine Art with AC-29. Is it critical that all five elements of the subcellular domains associated with the AC-29 pattern be evaluated in order to correctly classify an individual serum as AC-29? In other words, can it be classified as AC-29 with staining of only some of the five elements? It is necessary that your microscope settings and your HEp-2 slides be assessed for the ability to display the AC-29 pattern as described by ICAP. Some of the elements of the AC-29 patterns may not be readily identifiable. While the staining of the nucleoplasm and metaphase plate is very evident, the staining of the nucleolar organizer region (NOR), the nucleolus, and the cytoplasm requires explanation. For the NOR staining, it is important that different focal levels are analyzed by slowly adjusting the micrometer knob on the microscope up and down. The cytoplasmic staining may not be readily visible at lower serum dilutions and may be only apparent at higher dilutions. 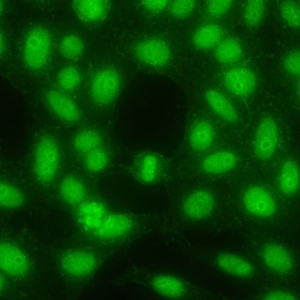 The staining of the nucleolus can be more inconsistent and varies considerably according to the HEp-2 slide brand/lot and other inter-manufacturer variables. Using the reference standard for anti-Topo I (CAT#: IS2135. ANA #09) from the Autoantibody Standardization Committee (ASC), one should be able to identify all five subcellular regions. Otherwise, troubleshooting should consider adjustments to your microscope settings, the HEp-2 slides and/or reagents used. The specificity of the definition of AC-29 pattern for anti-Topo I is more robust if all five elements are identified. If only the nucleolar staining is not observed, it is still acceptable to classify the sample as AC-29. The absence of any of the other four elements is incompatible with the AC-29 pattern provided that the lab can routinely observe the 5 elements using the ASC or other anti-Topo I internal standards. Finally, AC-29 is likely a problem for automated IFA microscopic systems with a lower numerical aperture and shallow depth of field because AC-29 pattern recognition requires examination at different focal planes.